October 9 - St. Denis and companions - Optional Memorial - My Catholic Life! Therapod, Spinosaurus, Ornithopod, Ceratopsid, Triceratops. Creatures with strange names from long ago with three toes, sharp protruding vertebrae, duck heads, three horns and jaws that crushed like the serrated walls of a trash compactor. A cephalophore? A neologism for another creature from long ago—a martyr who carries his own head after being decapitated. Today’s saint, Denis, is the most well known cephalophore. He displayed his own head in his arms like a soldier might point to his battle scars to prove his valor. An early medieval tradition states that Saint Denis, the first bishop of Paris, after being beheaded, preached a sermon on forgiving his assassins from the mouth of his own severed head while walking seven miles from his execution site to his grave. This legend is, historically, as flimsy as tissue paper, but theologically as solid as granite. Saint Denis was a missionary bishop sent to Gaul in the mid-third century, perhaps by the martyr Pope Saint Fabian. By that time, Gaul had been evangelized only in pockets. Blanket conversion of its numerous tribes was destined for a later century, when a unified kingdom imposed a unified faith. Even great movements must have modest beginnings. So the bishop Denis, the priest Rusticus, and the deacon Eleutherius made their way north to a small Roman city on the banks of the Seine River called Lutetia, where they served both native Romans and the Parisii, the local Gallic tribe. Denis and his companions settled on an island next to Lutetia called, today, Île de la Cité. It is the heart of Paris, the site of Notre Dame Cathedral, and the zero point from which all distances are measured in France. 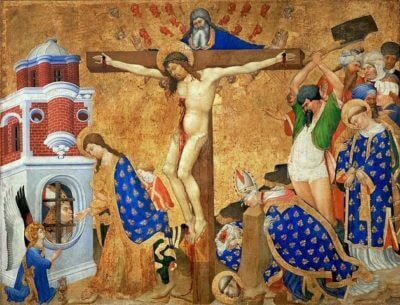 Denis and his companions, embodying the three Holy Orders, were successful enough to provoke the envy of pagan priests who convinced the local governor to imprison and torture them. Tradition relates that around 275 A.D., the martyrs were led to a pagan height overlooking Lutetia for their ritual beheading, thus lending the hill its name, Montmartre, or martyrs’ mountain. After the sword dropped and Denis’ head separated from his torso, legend relates that he chose his own place of burial by walking, head cradled in his arms, from Montmartre to the present day site of the Basilica for which he is the eponym. This church became the burial place of the kings of France, who strove to surpass each other in devotion to Paris’ patron. The form of capital punishment speaks, consciously or unconsciously, to the crime being punished. The heretic is burned, like his books, his flesh melting in the fires which replicate on earth those waiting for him in eternal damnation for having led the faithful astray. Similarly, every false clause, sentence, and paragraph of his books must float into the air as cinders, never to mislead again. Death by drowning during the Reformation killed those who rejected or taught falsehoods concerning the saving waters of baptism. Hanging, a firing squad, lethal injection, suicide by jumping, the electric chair: all convey something subtle by the manner in which they extinguish life. Decapitation is the purest form of capital punishment, caput being Latin for “head.” The decapitation of a bishop, in particular, was meant to separate the head of the Church from its body, leaving the ship without its pilot. Saint John the Baptist, Saint Paul, Saint Cyprian, Pope Saint Sixtus II, were all beheaded. The legend of Saint Denis is fanciful but profound. It understands the significance of decapitation and responds to it. Denis’ head is cleaved but still united. Christ’s head can never be separated from His body the Church. Christ is one, head and body, and every bishop embodies the fullness of Christ’s priestly ministry to teach, govern, and sanctify the people of God. The shepherd will always pastor the flock. The head will never abandon its members. Saint Denis and companions, you died in the mission fields of the Church’s eldest daughter, France. Your blood spilled long ago so that our blood would not spill today. We thank you for your witness and ask your intercession to make us fearless like you.